The Affordable Care Act (ACA) has placed new emphasis on the need to determine when and if related organizations must be treated as a single employer for purposes of meeting various ACA requirements. Simply setting up different companies under separate tax ID numbers does not relieve related employers from being treated as a single employer under controlled group rules. While the §414 rules are complex and often require detailed analysis by an advisor familiar with the rules, this brief provides basic guidelines to help employers and their advisors identify whether a particular employer is actually a member of a controlled group or an affiliated service group. The concept of a “controlled group” relies on the relative ownership structure of two or more entities, while the concept of an “affiliated service group” relies primarily on the service support relationship between two or more entities. Each of these types of single employer groups will be considered separately in the following sections. 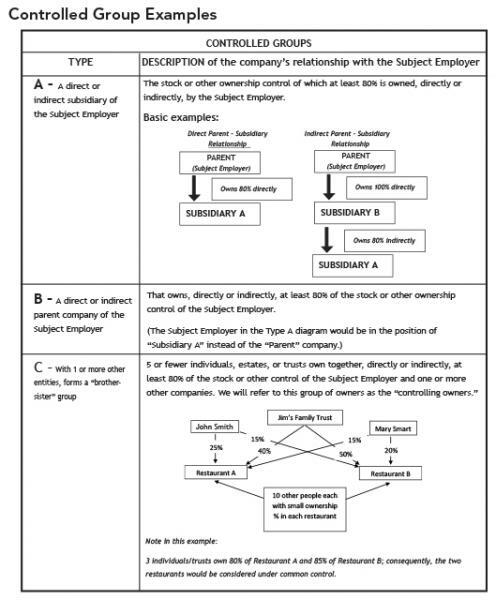 At a basic level, a “controlled group” includes each company whose relationship with the employer in question (the “Subject Employer”) falls within the description of Type A, B, or C in the table on the following page. While some corporate structures are simple enough to allow the determination of controlled group status to be made relatively easily, in other cases the complex web of ownership requires a detailed (and sometimes time-consuming analysis) of all the facts and circumstances. Types A and B in the following table are referred to as “parent-subsidiary” controlled groups. Type C is referred to as a “brother-sister” controlled group. In a basic initial analysis, if a company owns at least 80% of another organization, the two entities will generally be treated as a controlled group. Similarly, if a group of five or fewer owners owns at least 80% of two organizations, those two organizations may be treated as a controlled group. Conversely, if ownership is spread among enough separate companies, individuals, or trusts, the separate entities may be treated as separate companies for ACA purposes. This characterization is not meant to be a simple answer to a complex question; rather, it is meant to give a sense of when an employer should look more carefully into these rules. Considering the fact that significant ACA employer penalties may hinge on the determination of controlled group status, this analysis must be done carefully. 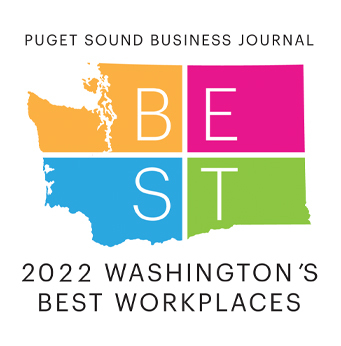 Other matters affected by this determination include application of benefit plan nondiscrimination rules, qualified retirement plans, and various business income tax-planning strategies. In addition to the 80% test indicated in the table for a Type C controlled group, the brother-sister relationship requires that, when considering the smallest percentage interest of each of the controlling owners among the companies, the sum of the smallest interests must exceed 50%. In the example, John’s smallest interest is 15%, the Trust’s smallest interest is 40%, and Mary’s smallest interest is 15%, so the total of the smallest interests is easily more than 50%, making the two restaurants a brother-sister controlled group. Ownership Control: For corporations, the type of control that is examined is the voting control of the shareholders or the percentage value of the outstanding shares. For partnerships, the percentage of capital or profits interest is used. For trusts and estates, beneficial or actuarial interest is used. Chains of Ownership: These basic controlled group structures can become quite complicated. For example, several parent-subsidiary chains may be involved, with many “parent” companies actually being intermediary companies such as Subsidiary B in the Type A diagram. Or, as another example, Restaurant A in the Type C diagram may also be a parent company for other entities, resulting in a mixed controlled group (i.e., both Type A and Type C) by drawing in any 80%-or-more-owned entity of Restaurant A. Consequently, it is important to ask about ownership of, and by, each entity. Family, Trust, and Estate Relationships: With regard to only the brother-sister form of controlled group, ownership can be attributed from and to parents, children, and grandchildren, as well as to grantors and beneficiaries of trusts and beneficiaries of estates. So if ownership or control is distributed among such persons or entities, a closer review of the arrangements would be required. By arranging the ownership of related businesses in an artificial manner, an employer could avoid controlled group status under the foregoing controlled group rules. The purpose of the affiliated service group rules is to prevent such circumvention by expanding the type of related companies that must be considered as a single employer. The sole function of Management Company X is to provide managerial services to restaurants A, B, C, and D. The spouse and three children of the president of Management Company X together own more than 50% of the interest in each of the four restaurants. Medical Clinic M is owned by three physicians in equal shares. The support staff of Medical Clinic M is employed by Regional Staffing Corporation, which provides medical staffing services to a variety of companies. Medical Clinic M is a shareholder in Regional Staffing Corporation. If a group of companies includes a “service organization,” then companies falling within one of the following descriptions should be analyzed for purposes of determining whether the group of companies forms an “affiliated service group” that must be treated as a single employer. b. 10% or more of the interest in Company Bx is held by someone who is a highly compensated person either in Company A or in another Company Bx. 2. The principal business of one of the companies is to perform ongoing management functions for the other. If two or more companies are identified as possibly being in one of the foregoing arrangements, additional evaluation will be needed to determine whether there is, in fact, an affiliated service group. This evaluation should be conducted by an experienced professional. Any group of related organizations that wants to assume they will be treated as separate entities should be sure, based on their ownership structure, that they do not fall under the controlled group or affiliated service group classification. If they are not sure, they must seek the advice of a qualified advisor to make the determination. One final note: Given the impact of these rules under the ACA, owners may be inclined to “reorganize” their holdings to avoid single employer status among several entities currently falling within these groups. Caution is advised insofar as the IRS retains authority to regulate abusive situations, and the ACA specifically states that “employer” includes “any predecessor of such employer” – a provision that could be interpreted in a way that would restrict the ability of an existing entity to divide itself into smaller parts for purposes of avoiding ACA requirements. As always, for more information, please contact your Parker, Smith & Feek Benefits Team.